Looking forward to enabling an effective push notification feature for your mobile application? Push notifications are a highly converting marketing tool that can bring relevant content to your users. It enables personalized support to the users who have downloaded the app and customers can receive updates and solve issues without being forced to leave the app. Nowadays, many mobile platform vendors have adopted a push notification feature to support multiple user-preferences from one app. Before using push notification tools, keep in mind that you are able to send personalized messages to all major platforms, unfortunately, not all features are supported on all platforms. In this article, I will provide you the framework for evaluating push notification tools and highlight the best players in the market depending on the company size and objective. Firstly, let’s take a quick look at how does Mobile Push Notification work? Mobile push notifications give your app a voice. They organize a strategy to encourage a user to take actions on-the-go. An in-app notification is sent to the customer from a brand regarding their updates, who in turn, will be automatically diverted to the mobile app page without any conversation. For example, eCommerce giant Amazon app generates push messages to the customers about new arrivals depending on their previous orders. This way, you can boost user-engagement to hike your business and revenue. 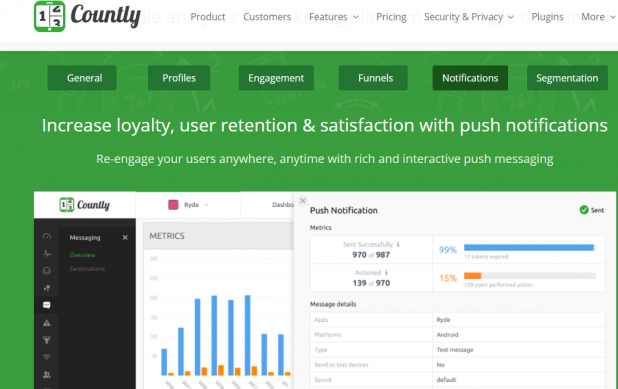 What are the top 10 Push Notification tools for your business? Push Whoosh can handle traffic in the millions through its scalable and outstanding ready-to-use system. Marketers can send actionable content to the segmented audience based on their marketing strategies. Key features: Remote API, multi-language support, dedicated server, cross-platform support. This allows marketers to send personalized push notifications to the users. It is exclusive because of its in-built analytics tool. The ghost push facility counts the number of users opting out. Key features: Friendly interface, amazing customer segmentation, identify active/inactive users to deliver push messages, automated life-cycle campaigns. This tool tracks the user’s activities and behavior on their mobile app so that you can target notifications based on it. It allows companies to embrace user-retention and engagement by using a wide range of services that include auto tracking, A/B testing and push notifications. Key Features: Auto tracking, real-time data analysis, precision segmentation, event tracking. It performs audience analysis and targets message campaigns. It includes wallet studio that is integrated with Apple Passbook and Google Wallet so merchants can easily proceed with various push notifications process such as coupons, loyalty cards and promotions. Key Features: In-app messaging, predictive insights, multi-channel messaging, segmentation, and high ROI. It serves as one of the best marketing platforms that allow marketers to run multiple push notification campaigns at the same time. It also includes rich messaging options such as in-app pop-up messages, message analytics and so on. Overall, it boosts retention and scales up personalization efforts that drive your app to ultimate success. Key Feature: Message automation, user-behavior analytics, time zone settings, In-App messaging. This tool allows you to reach mobile app messaging users and provide them with a streamlined app experience. The mobile SDK delivers rich content messages and push notifications. It provides service from a small business to a large multinational organization. 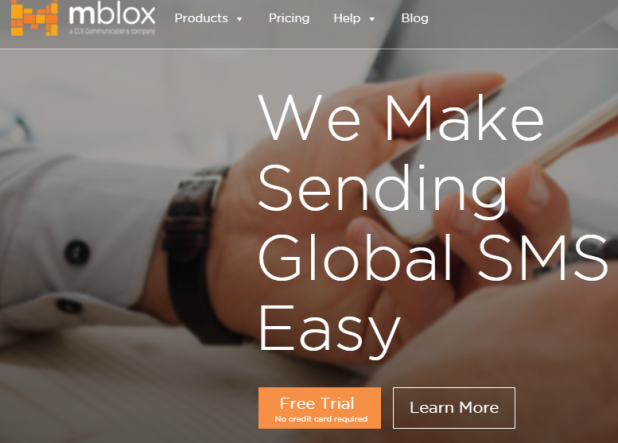 Key Features: Two way messaging, multiple format message, data-driven campaigns. It offers many call-to-action services apart from the push notifications. It provides automated alerts, notifications, updates, and even news. Moreover, it also supports real-time chat and pushes notifications for your end users. Key Features: Open source and cross-platform service, video calling and messaging, updates. This is a mobile analytics and marketing platform on a single dashboard itself. It allows you to send videos and images that boost open-rates and customer retention. It enhances a Smartphone user’s experience. Key Features: Scheduled Delivery, deep link technology, easy set-up, conscious for content. StreetHawk focuses on increasing customer lifetime value through engagement. Each push notification is supported by relevant analytics and A/B testing to induce engagement. It is an open source SDK that gives you “Drip Sequences” for push and e-mail. Key Features: Personalized onboarding, minutes for integration, simple push notifications. OneSignal is a high volume and a reliable push notification service for websites and mobile applications. It provides “RESTful server API” and an online dashboard for marketers to design and send push notifications. Key Features: Real-time tracking, incredibly scalable, easy-to-use, segmented targeting, and automatic delivery. Finally, these are the most powerful tools used by the biggest firms to keep consumers engaged and fed useful app content. The user no longer needs to use the app for receiving updates. Hence, we conclude that push notifications are user-friendly marketing strategy and a lot more can be done with the help of push notifications. With the above, you now have several options among these that suit the best of your needs. Do let me know in the comment section below if I missed any. Anil Parmar is the co-founder of Glorywebs that specializes in WordPress plugin development services, Web design and development, digital marketing and more. Websites, themes and plugins we develop have a common No.s 1 goal: Keeping it as simple as possible for technical as well as non tech geeks. Follow him on Twitter @abparmar99 & say Hi! The post 10 Popular Push Notification Tools You Can’t Ignore appeared first on SiteProNews.